Playhouse, located in the heart of Hollywood, is the face of the city’s historic Fox Theatre. Selected by Reuters as one of the “Top 10 Nightclubs in the World", Playhouse Nightclub is an elegant, versatile space with state-of-the-art lighting, sound and design. The main room consists of three bars, including a marvelous round bar in the center of the room surrounded by plush VIP booths. The upstairs lounge features a retractable glass skylight that gives clientele the precious opportunity of enjoying the stars in an open-air room. Playhouse Nightclub, owned by Playhouse Group, is one of the only locations able to provide all aspects of production. From In house Special Event coordinators to In- House Catering- We can do it ALL. The Playhouse group strives to comply with all Client's needs and make for seamless events! Playhouse allows for both corporate and private events, easily accommodating live music concerts, film premieres, fashion shows, film shoots, press junkets, movie / tv screening, and day time conventions. 10500 sq. ft. space with a capacity of 50 guests. Fully equipped DJ booth and mixing console with a professional function one sound system capable for club and live music, custom lighting rig with programmable LEDs, large projection screen available for screenings, full stage for live performances. Please visit our website for more details. 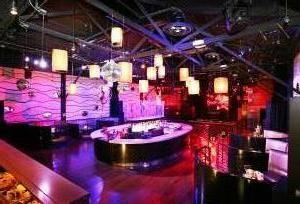 Playhouse Nightclub is a versatile event space with over 10,000 Square feet, and a 750 person capacity. It has (2) rooms, 4 Bars, and a spacious dance floor. Equipped with state of the art Funktion One Sound Systems and custom lighting, it is perfect for any event need. Atmosphere/Decor: Vegas Style Nightclub .